﻿While driving the winding road leading west to the coast, banks of snow were piled high along Highway 4’s Sutton Pass, with even more building up on the hood of my truck. Struggling to get Radio reception through a sky thick with white flakes, and thankful that I invested in a new set of tires, I hoped this truly was March’s last attempt to extend winter. Turning the calendar over to April was a welcome thought, and I knew that spring-time weather on the West Coast of Vancouver Island couldn’t be very far off, providing more ample opportunities for the outdoor activities that make our region so famous. Sport fishing in the Tofino area is a popular activity that is definitely affected by the change of seasons, and for local anglers, April is favoured as the true start to local Saltwater and Freshwater fishing opportunities. Species such as Salmon, Halibut, Steelhead and Trout all become more active and available for anglers who purely enjoy the sport, as well as those that rely on fresh seafood as part of their diet. Both can be synonymous and somewhat infectious, while living a coastal lifestyle. With the 2009 and 2010 sport fishing seasons playing out to be the best in the last decade, local and visiting anglers are excited to hear that 2011 is forecasted to provide exceptionally strong Chinook and Coho Salmon fishing opportunities, along with increased sizes and local abundance of Halibut. The strength of current forecasts for the Columbia River Chinook and Coho returns have been a definite highlight for local fisheries, and provide an extremely strong portion of the west coast of Vancouver Island sport fishing opportunities. So strong in fact, that the Chinook salmon from coastal Washington State and Columbia River Hatcheries make up well over 80% of Tofino’s early season Salmon fishery, providing Tofino with what has been considered Southern B.C.’s most consistent Salmon fishing. For the 2011 season, these exceptionally strong spring runs of Chinook salmon should appear along Tofino’s outer coastline by early April, with the “wave” of southern migrating Chinook continuing through July and early August. These transient salmon find the habitat and abundant food source along Tofino’s offshore banks a prime setting for the juvenile stage of their life cycle, as well as the final adult stage when they gain the mass and strength that help them become true “memory makers”. Fishing experiences during this time most often include Halibut encounters, to compliment great early season Chinook Fishing. As a great option, Fishing, Whale watching and a soak in the Hot Springs can make for a diverse and memorable day for your private group during the early season while visiting the Tofino area. The weather is obviously a little cooler than the summer, but Tofino’s offshore fishing action for Chinook Salmon and Halibut in April can often be as intense as the peak season months of June, July and August. Anglers heading out with their own boats are reminded to start the season the right way, by going over your safety equipment checklist, and making sure engines, pumps and batteries are in good working order. When in doubt, don’t head out as the weather can still turn quickly, and there are fewer boats on the water in the event of needing assistance. Whether you are thinking about the unbeatable flavour of early season Chinook Salmon grilled to perfection, or your first battle with the “King of Salmon” or the Pacific’s largest flatfish, you will find it rewarding and memorable to make get out on the Tofino area waters this spring. 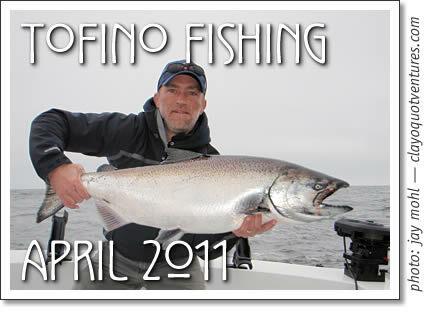 Tofino fishing report for Tofino, Ucluelet and Clayoquot Sound by Tofino fishing guide Jay Mohl for Tofino Time Magazine in April 2011.